The "Parents/Guardians" section of the "Parents/Siblings" tab in the Student records has some great capabilities. Just in case you have questions or would like a refresher, we've pulled together some additional notes on more detailed parent/guardian information tracking. As some background, each parent record is treated kind of like a "card" of information. When you create a new parent record in the Students module, the system collects all of this information together such that when you link students as siblings/related at the same site, the parent's card is shared with both/all student records. Updating the parent information card for one student updates the information for all of their students. 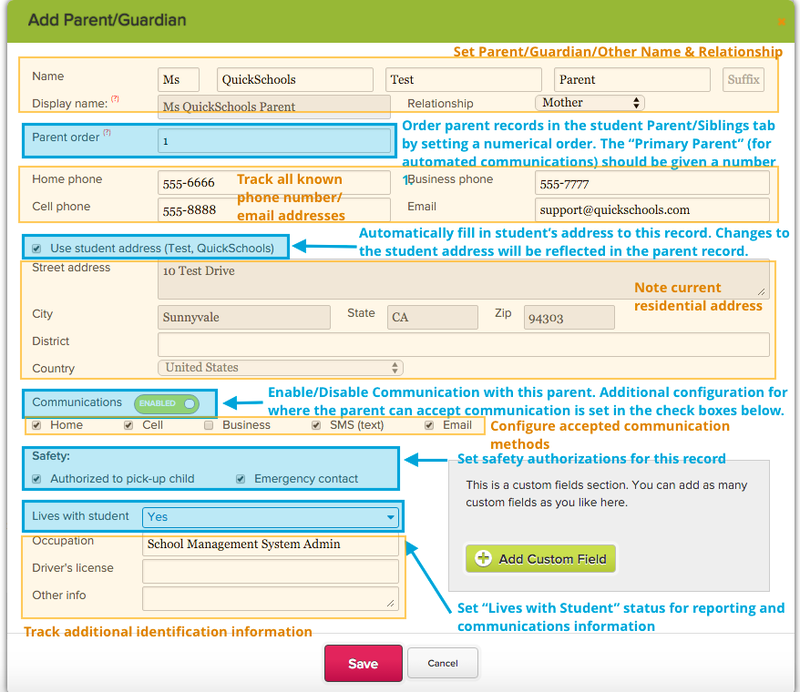 Parent Order - This field lets you set an order number for a parent record to sort the order that parents appear in a their students' records. An order number of 1 is used to designate the primary parent for communication regarding the student. Use Student Address - This checkbox allows you to link a parent's address to reflect their student's current address (Changes to the student address will be reflected in the parent address). Communications Enable/Disable - Turn On/Off all communication with a parent. For example, a parent may not be allowed to receive communication for a student, but you could still use the communications preference checkboxes to note which methods of communication would be acceptable if this parent had to be reached. Safety - The "Authorized to pick-up" and "Emergency contact" options may be set independently and are used for tracking a parent/guardian/other's allowed access to pick up their student or serve as an emergency contact. Lives with Student - As an additional level information for communication, safety, and reporting, the "Lives with Student" dropdown is set separately from the address and notes whether this individual lives with the student - regardless of what their entered address may be. Of course, please feel free to take a look at all of these options and let us know or chat in if you have any questions or need any tips on how to track any information.